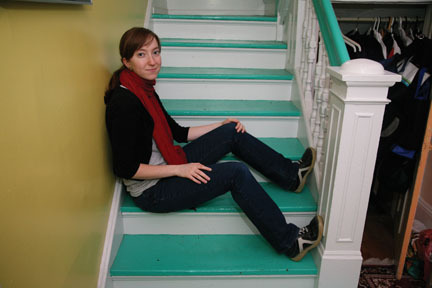 Sara Lipshutz, who enjoys being busy, snags a moment on the staircase in the Elm Avenue house she shares with four other students. “I always wish I had more free time to just relax, take a nap, go for a walk, but the truth is, I love packing my schedule to get what I want to do done,” she says. When biology major Sara Lipshutz ’11 talks about her life at Swarthmore, you can’t help being awed by the number and scope of activities she crams into her 18-or-so daily waking hours. You also feel compelled to breathe for her, because she appears never to take the time to do it for herself. Laughing and gesticulating, Lipshutz emanates an enviable exuberance. Brace yourselves, and race with her through a typical Swarthmore Tuesday. Lipshutz wakes at 6:45 a.m., showers, dresses, snatches a quick breakfast of Fruit Loops and a clementine, then hurries to the Swarthmore station to jump on a train for one stop to Wallingford, followed by a brisk walk to Strath Haven Middle School. She observes an eighth-grade physical science class as part of the Introduction to Education course she’s taking. She’ll note her observations later in a journal. Back on campus by 10:30, she enjoys an hour auditing Assistant Professor of Biology Colin Purrington’s Evolution class. Then it’s off to Animal Behavior with Assistant Professor of Biology Julie Hagelin. Students cram into a College van for a half-hour ride to the Philadelphia Zoo, munching on bagged lunches provided by Dining Services. Once there, it’s time for lab. Seeking answers to questions set by the zookeepers, the students observe ways in which a variety of animals interact socially and use their living spaces. For the next couple hours, Lipshutz and her lab partner focus on the feeding behavior of juvenile pied tamarinds, recording their findings in preparation for a report. When lab ends, they pile back into the van for the return to Swarthmore. Because she’s a writing associate (WA) for an Intro to Biology class, Lipshutz must go straight to a meeting with Nick Kaplinsky, an assistant professor and plant biology expert, and lab instructor Heather Hassel Finnegan to discuss upcoming student lab reports. (Writing Associates—known as WA’s—read drafts of students’ papers and suggest ways they might be improved.) From there, she runs to a class on African dance with “Miss Jeannine” Osayande. “I absolutely love that class!” she gushes. At 6 p.m., after dance is over, she snatches a veggie burger from Essie Mae’s, then begins her WA shift from 8 to 10 p.m. at the Writing Center. “Sometimes, if I have no papers to read, I do school work. When my shift ends, I go to the Science Center and work until midnight,” she says brightly. Phew! And as if all this were not enough, Lipshutz has been involved in a number of stage productions and is a member of the comedy group Boy Meets Tractor, which, she says, is a great outlet for having fun and has also helped her hone her creative writing, acting, and video shooting and editing skills. Lipshutz clearly enjoys being busy. Besides Animal Behavior and Evolution, she’s also taking Ecology this semester. “That’s three Big Bio classes—you can go out and see and touch the things you’re studying,” she says. Lipshutz says she was initially discouraged during her college search, because she found no schools that met her “very high expectations” for herself. 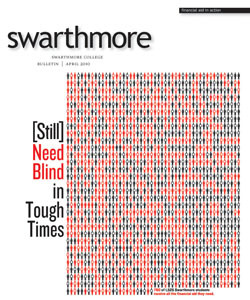 Then someone suggested that Swarthmore would be a “great match” for her. With grandparents living only a half-hour away in Elkins Park, Pa., she visited the campus and fell in love. “You know how people say something feels just right. That was me when I visited Swarthmore,” she says. So she applied early decision and was accepted. At the time, on her mother’s advice, she made the issue of funding only secondary in her choice of school. More important, she says, was that she’d found a school where she knew she’d thrive. And because of Swarthmore’s generous scholarship, she can. Lipshutz says she feels very fortunate that the College has helped her and her family. 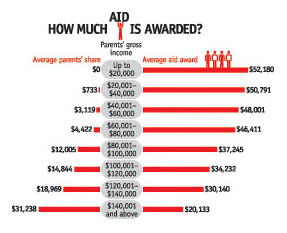 “I believe that probably everyone’s family has trouble to some extent paying for college. It’s a huge expense.” As one of two daughters of a single parent, she feels indebted to and proud of her mother, who advised both her children to aim for acceptance at the best schools possible and figure out the finances later. Her younger sister is an honors scholar at another private college. The interview over, Lipshutz finds herself with a couple hours free. She’s torn between taking a nap and heading for the library. After a second or two of indecision, she says, “I think I’ll go to the library.” And away she bounds. 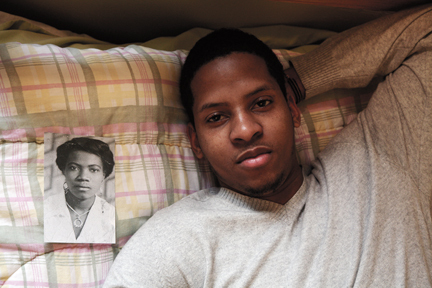 John Boucard cherishes a photo of his maternal grandmother, who passed away when his mother was very young. His mother made copies of the photo for each of her children to keep with them, wherever they are—including in John’s room in Wharton. The Boucard children are the first generation of their family to attend college. John’s older brothers have both earned college degrees. His older sister has an associate’s degree, and his twin sister, after two years of community college, is saving to complete her degree at Montclair­—N.J. State University. While Sara Lipshutz heads for Strath Haven Middle School, senior John Boucard is gathering his thoughts over French toast and eggs at Sharples Dining Hall. As a teaching assistant (TA) in Professor John Jenkins’s Genetics course from 8:30 to 9:35, he must be well prepared—not just today but also for two more weekly sessions of the course. On Sunday and Wednesday evenings from 7 to 9 p.m., he co-hosts two-hour genetics study sessions, and during exam time, two four-hour sessions from 7 to 11 p.m. Besides the TA job, Boucard also serves as a student academic mentor, which consumes about four hours a week; he’s a party associate coordinator, assisting with Pub Nite and weekend events; and he’s involved with the Swarthmore Christian Fellowship, attending weekly meetings on Wednesday evenings. During the first half of the fall semester this year, following Genetics, Boucard completed an Aquatics course to acquire competency in swimming, a requirement for graduation. Boucard, a Haitian American with a soft, lilting voice and a deep rich laugh, is a biology/premed major who attends the same Animal Behavior course as Lipshutz. He, too, enjoys the expeditions to the zoo. “My lab partner and I observe the grooming behavior of spectacled langurs as indications of social status in the group,” he says. “We compare grooming received with grooming given and have noticed that higher-ranking animals get groomed more, and those of lower ranks do more grooming.” He mentions that a large high-ranking female langur that had to leave the group for a while had been grooming more since her return, indicating a loss in status during her absence. Because so many evenings are taken up with his campus jobs, Boucard uses the time between lunch and dinner to study, either in his Wharton dorm room or Cornell Library—and, if possible, to catch a little down time. To help maintain a healthy balance between the academic and the physical, he tries to make a point of visiting the Mullan Fitness Center a couple days a week before dinner. “And I try not to work on Saturdays, to relax and let my mind rest. It works out well,” he says. Boucard’s Swarthmore education is funded by a McCabe Scholarship. He also receives grants from the Union League of Philadelphia and the Ginsburg Family Foundation. Born in Brooklyn, N.Y., Boucard moved, as a 2-month-old, with his parents and siblings, to his family’s home in Jacmel, several hours south of Port-au-Prince, Haiti. Along with a twin sister, he is the youngest of five children. When he was 7, Boucard’s father passed away; two years later, his mother developed breast cancer and returned to the United States for treatment. Once recovered, she believed that her children would have a better chance for a good education in the United States, so they settled in Newark, N.J.
As a seventh-grader, Boucard was identified as gifted and placed in the New Jersey Seeds Program, which helps students gain acceptance into private high schools around the country. “The program ran over two years, through the summer of seventh grade and then every Saturday during eighth grade. So in eighth grade, I went to school six days a week. That was followed by an intensive six-week program during the summer, before we transitioned to high school,” he says. Boucard received substantial aid from the Church Farm School in Exton, Pa., where he spent his high school years. After learning about Swarthmore from his high-school friend and classmate who had applied to the College, Boucard applied, too. 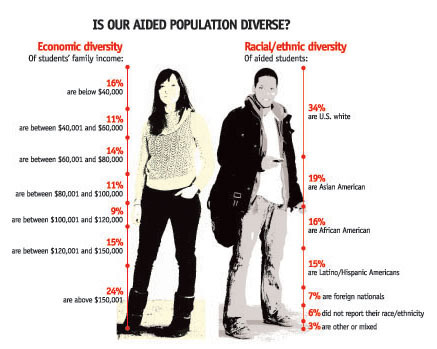 Both were accepted, and Boucard was called to interview for a McCabe Scholarship. Last summer, Boucard, who had interned at Newark Beth Israel Hospital in New Jersey while still in high school, returned to Jacmel to shadow a surgeon at a local hospital. “Two weeks into my internship, the surgeon’s assistant became sick, so I took over the assistant’s position for the rest of the summer,” he says. “I helped him with a leg amputation, passing instruments, holding the leg still, moving things around, mopping up where necessary. It was an invaluable experience,” he says. [Still] Need Blind in Tough Times.